Please cite as: Deflem, Mathieu. 2018. 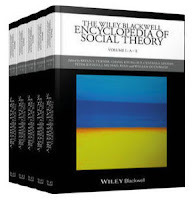 “Social Control.” In The Wiley Blackwell Encyclopedia of Social Theory, edited by Bryan S. Turner. Malden, MA: Wiley-Blackwell. Abstract: Social control refers to the foundation of social order as well as to the definition of and response to crime and/or deviance. The concept was initially introduced in sociology to refer broadly to the foundations of social order, especially in societies that were undergoing rapid social change and exhibited an increasingly individualist values system. Subsequently, the concept was redefined in critical-sociological terms to refer to the coercive mechanisms of order. From then on, social control began to be understood in a more delineated fashion to refer to the control of deviance and/or crime, in which meaning the concept is most commonly understood and applied today. The sociological concept of social control refers to the mechanisms, structures and processes that function to provide social integration and conformity, ranging broadly from the foundations of social order at the level of society as a whole to the control enacted by various specialized institutions and their agents concerning specific forms of behavior and (mis)conduct. This comprehensive understanding corresponds to an important theoretical transformation in the conceptualization of social control over the course of the development of sociological theorizing from the classical to the modern age. The concept of social control was originally introduced in American sociology in the late 19th-century to refer to the institutional foundations of social order (Chriss 2013; Deflem 2008). Specifically, social control referred to the capacity of societies to regulate themselves without the need for force or coercion. This broad concept of social control, conceptualized in a framework of social harmony, was explored at both the macro and micro level. From a macro-theoretical viewpoint, the most distinct and influential relevant effort was made by sociologist Edward Alsworth Ross (1901) who treated social control as the foundation of social order in organic societies characterized by a high degree of individualism. Social control functions were thereby argued to be fulfilled by a wide range of social institutions, such as law, morality, custom, religion, art, and family. From a micro-theoretical viewpoint this harmonious understanding of a broad notion of social control was given most concrete expression in the work of philosopher and behavioral psychologist George Herbert Mead (1934). Mead expressed the idea that social control and self-control co-existed by introducing the notion of a self as consisting of both a unique ‘I’ and a social ‘me’. The notion of a harmonious understanding of social control collapsed during the first half of the 20th-century under influence of a number of important events of societal upheaval, such as the Great Depression following the stock market crash of 1929, the rise of fascism and Nazism in Europe in the 1930s, and the two world wars that ensued. Under these conditions, sociologists began to understand social order, and social control as one of its necessary foundations, in more conflictual terms related to authority, power, and inequality. This theoretical re-orientation brought about a more specific focus on the instruments of social control that existed beyond and irrespective of an internalization of norms. Most distinctly, it inspired the conceptualization of the institution of law as social control in complex societies with multiple value systems and a growing degree of impersonalism and anonymity. Irrespective of the question of their legitimacy, legal norms are thereby centrally conceived as being endowed with coercive power and reliance on specialized agencies for their enforcement and administration. The conceptualization of law as social control brought about an additional change in the sociological understanding of the concept, which has remained in effect until the present day. With the development of modern sociology in the post-World War II era, various specialty areas of sociological scholarship began to develop, including the sociological study of deviance and/or crime. Defined as the violation of (general) norms and the violation of (specific) criminal norms, respectively, deviance and crime intimately connect the study of rule-violating conduct with the normative frameworks in which such conduct occurs. Criminological sociology is thus conceived as also including a sociology of norms and law. Relevant sociological scholarship focuses on the institutions, positions, roles, and agents that are involved with the enforcement and administration of various norms of conduct. It is this whole complex of structures and processes that is from hereon treated under the heading of social control. In view of evolving theoretical discussions in sociology, three main modern conceptions of social control in terms of crime and/or deviance can be differentiated (Deflem 2008). One, in sociological crime-causation theories, primary attention goes to the study of the causes of crime as a social phenomenon. Secondary to this attention is a focus on social control as a functional response to crime in order to restore social integration. Two, crime-construction theories refocus the attention of sociological inquiry to the side of social control as the definition of crime as one specific process in the labeling of deviance. This process of criminalization is studied at multiple levels, ranging from the actions of various agents of social control at the level of the interaction order to the macro-level institutions involved with law, police, and punishment. Three, conflict-sociological perspectives build upon the constructionist viewpoint to articulate social control and crime within a broader context of the social order under conditions of advanced capitalism. The study of social control then becomes part of a broader study (and critique) of society. Sociologists such as Morris Janowitz (1975) and Jack Gibbs (1994) have attempted to keep the broad understanding of social control in function of the foundations of social order alive. Yet, the more delineated understanding of social control in terms of deviance and/or crime remains by far the most widespread manner in which the concept is used today. On occasion, the term is also applied to other social behavior of a more or less problematic quality, such as illness and poverty, to contemplate on the social control functions of other institutions besides law, such as medicine and charity. Most recently, the sociological study of social control has especially focused on the influence of technological advances of crime control, typically under the heading of a new field of so-called surveillance studies, and additionally centered attention on the influence of processes of globalization, most notably the world-wide response to international terrorism. Chriss, James J. 2013. Social Control: An Introduction. 2nd ed. London: Polity Press. Deflem, Mathieu. 2008. Sociology of Law: Visions of a Scholarly Tradition. Cambridge: Cambridge University Press. Gibbs, Jack. 1994. A Theory About Control. Boulder, CO: Westview. Janowitz, Morris. 1975. “Sociological Theory and Social Control.” American Journal of Sociology, 81: 82-108. Mead, George H. 1934. Mind, Self and Society from the Standpoint of a Social Behaviorist. Chicago: University of Chicago Press. Ross, Edward A. (1901) 1926. Social Control: A Survey of the Foundations of Order. New York: Macmillan. Cohen, Stanley, and Andrew T. Scull, eds. 1985. Social Control and the State: Historical and Comparative Essays. Oxford: Basil Blackwell. Meier, Robert F. 1982. “Perspectives on the Concept of Social Control.” Annual Review of Sociology, 8: 35-55. Parsons, Talcott. 1951. The Social System. New York: The Free Press. Pound, Roscoe. 1942. Social Control Through Law. New Haven, CT: Yale University Press.